We’d love your help. Let us know what’s wrong with this preview of Intractable Heart by Judith Arnopp. The people of the north, torn between loyalty to God and allegiance to their anointed king, embark upon a pilgrimage to guide their errant mona 1537. As the year to end all years rolls to a close, King Henry VIII vents his continuing fury at the pope. The Holy Roman Church reels beneath the reformation and as the vast English abbeys crumble the royal coffers begin to fill. To ask other readers questions about Intractable Heart, please sign up. My introduction to Ms Arnopp's work was The Winchester Goose, which was significantly different from other historical fiction books to intrigue me. With trepidation I read, The Kiss of Concubine, (after all, Anne Boleyn is one hell of a major historical figure to take liberties with) and was swept away by her story telling skill. OK, so could the story of one of Henry VIII's lesser known wives live up to expectations? Oh yes! Ms Arnopp has grown and matured as a writer and can proudly hold her h My introduction to Ms Arnopp's work was The Winchester Goose, which was significantly different from other historical fiction books to intrigue me. With trepidation I read, The Kiss of Concubine, (after all, Anne Boleyn is one hell of a major historical figure to take liberties with) and was swept away by her story telling skill. OK, so could the story of one of Henry VIII's lesser known wives live up to expectations? Oh yes! Ms Arnopp has grown and matured as a writer and can proudly hold her head up amongst the best. This faultless telling of a little known story is addictive from beginning to end. If you give Ms Arnopp as chance, she will create a world that is shudderingly real, peopled with saints, sinner, rogues, and survivors. This is the story of Katheryn Parr, sixth wife of Henry VIII, told in the first person from four perspectives, each with a part of the book, and their own part of the tale to tell. First is Katheryn's step-daughter, Margaret Neville, then Katheryn herself, followed by Thomas Seymour (Katheryn's fourth husband), and finally another of Katheryn's step-daughter's, Princess Elizabeth. I already knew the story, and this is a good retelling. It flows, it's easy to read and the changes of perspective a This is the story of Katheryn Parr, sixth wife of Henry VIII, told in the first person from four perspectives, each with a part of the book, and their own part of the tale to tell. I already knew the story, and this is a good retelling. It flows, it's easy to read and the changes of perspective are well timed in each instance. I absolutely love history and everything to do with the Tudors and when I saw a fictional novel about Katheryn Parr, I knew that I needed to read it. When first starting the book, I had very high expectations as I have read the author's other books and loved them. I did enjoy the book, but for me personally, there was something lacking and I cannot put my finger on it. I really enjoyed reading more about Katheryn before she was married to Henry VIII and seeing her love for her two stepchildren. I absolutely love history and everything to do with the Tudors and when I saw a fictional novel about Katheryn Parr, I knew that I needed to read it. When first starting the book, I had very high expectations as I have read the author's other books and loved them. I did enjoy the book, but for me personally, there was something lacking and I cannot put my finger on it. I really enjoyed reading more about Katheryn before she was married to Henry VIII and seeing her love for her two stepchildren. It was also interesting getting Katheryn's point of view about her marriage to Henry and how she, at first, was horrified and hated what came with being Henry VIII's queen. However, as her marriage progressed, she came into her own and came to see Henry as a companion and knew how to keep Henry from losing his temper, especially knew what say and do after she was given her warrant for her arrest. She was a clever lady and Arnopp definitely shows this side to Henry VIII's last queen. I loved how the book was split into different sections to tell Katheryn's story from the point of views of the people who knew and loved her; Margaret Neville (her stepdaughter), Katheryn (herself), Thomas Seymour (her husband after Henry VIII) and Princess Elizabeth (to be Elizabeth I, who was her stepdaughter when Katheryn married Henry VIII and Elizabeth lived under her care). I must admit that I did feel uncomfortable when reading about Thomas Seymour and Elizabeth. I understand that maturity and childhood were seen differently in the Tudor period, but the author portrayed Elizabeth as a seducer of Thomas Seymour. However, I am able to understand that the author is trying to use historical events and turn it into drama for fictional purposes. I loved how this book was structured, ie, the whole story told from four different first person points of view. It starts off during the Pilgrimage of Grace, the uprisings in the north following Henry's reformation of the English church, and this part is told from the point of view of Margaret, Katherine's stepdaughter from her second marriage. Showing events at court and in the country from this young girl's point of view was an artful way of giving the backdrop to Katherine's life before she m I loved how this book was structured, ie, the whole story told from four different first person points of view. It starts off during the Pilgrimage of Grace, the uprisings in the north following Henry's reformation of the English church, and this part is told from the point of view of Margaret, Katherine's stepdaughter from her second marriage. Showing events at court and in the country from this young girl's point of view was an artful way of giving the backdrop to Katherine's life before she married the King, and I very much liked Ms Arnopp's invention about Margaret being infatuated with well-known rake Francis Bryan. Next, Katherine's own section. I liked it, but thought it a little rushed through; I had no sense of years passing, and occasionally I felt I was having facts about her life related to me, rather than being told a story. One minute Katherine would be hoping she could reconcile Henry's family, and in the next paragraph it would be done, and the Anne Askew affair/the threat of Katherine's own arrest was over and done with in a few pages. But I did still like it, which is a nod to Ms Arnopp's ability to keep the reader turning the pages - and I'm the first one to moan if a book is too long-winded! Henry VIII was portrayed so well, and it got much better towards the end, with Katherine's desperation at being ousted as soon as people like Edward Seymour realised Henry was dying. And then we come to the other well-known rake, Thomas Seymour. This part was excellent. I like that Ms Arnopp did not tell the story of Seymour and Katherine as star-crossed lovers; her insight into the chancer that he probably was is a terrific piece of writing. I've read before about the sexually orientated rough and tumbles between him and the young Elizabeth Ist and found the scenario most peculiar, as Katherine was not only aware of but actually witnessed them (and even joined in) on occasion, but in this book I had the feeling that she would put up with anything just to keep Thomas's love, rather than being naive about what was really going on. The story is ended with a short part from Elizabeth's point of view, as we learn about the aftermath of Katherine's time as queen and subsequent errors of judgement, though, indeed, some would say that she at last found some true happiness. I liked the viewpoint that Katherine had an influence on how Elizabeth conducted herself in later years, too; she probably did. A beautiful book about Katheryn Parr, and her view on life, the court, and her marriage with Henry VIII. What is great about this book is that it overlaps small pieces of time and is written from 4 characters, Mary, Elisabeth, Katheryn and Thomas Seymour ... which gives an excellent picture of the events and feelings that it creates among all these people who connected to each other. The author is very clear about the feelings of Katheryn and how she thought about the fact that Henry took her as h A beautiful book about Katheryn Parr, and her view on life, the court, and her marriage with Henry VIII. Despite her difficult relationship with Henry, she was a sweet stepmother and her caring character is lavishly addressed ! Interesting information and story on Henry VIII last queen. Katheryn Parr is one of those historical characters that we tend to dutifully study, preparing ourselves for a stolid, tedious effort. I think Charles Laughton said it best at the end of his PRIVATE LIFE OF HENRY VIII: "Six wives, and the best is the worst of them all." Or maybe it would be better to say that I, for one, was unfairly influenced by his delightful portrayal which took years of education to rectify. Yet poor Katheryn didn't budge very far in my estimation. Luckily, Judith Arnopp sh Katheryn Parr is one of those historical characters that we tend to dutifully study, preparing ourselves for a stolid, tedious effort. I think Charles Laughton said it best at the end of his PRIVATE LIFE OF HENRY VIII: "Six wives, and the best is the worst of them all." Or maybe it would be better to say that I, for one, was unfairly influenced by his delightful portrayal which took years of education to rectify. Yet poor Katheryn didn't budge very far in my estimation. Luckily, Judith Arnopp sheds some welcome light on this stalwart lady. Kathryn was so much more than a survivor. Fatally attracted to Thomas Seymour, she must have had something going for her to keep him interested enough to marry her after her third widowhood. She made a family for Henry's motherless children. I was surprised to see her as acting Regent during Henry's final French war, which implies a certain competence. Of course, she was a staunch Protestant, which almost led to her undoing. I was also surprised to see the tyrant King Henry depicted almost as a pussycat in her presence, as though her influence on him was invariably soothing. Even the pivotal event where she was nearly arrested comes across to me as the machinations of her enemies, and Henry's role seems almost incidental. I found this all a little disconcerting, since it seems to redefine the King as a kind of nice guy after all. Maybe this is true? I'd like to think so, but I'm not sure I can accept it. All these characteristics and more are depicted in this novel, which is quite a page turner. As you would expect, there is not a tremendous amount of action, but the writing is smooth and enjoyable. Katheryn comes across as a lady I very much would have liked to have known. Queen Katherine Parr is usually portrayed as a keenly intelligent and dutiful wife. Married three times to much older men - including Henry VIII - she was known as a skilled caretaker and faithful companion. Her fourth, short-lived marriage - to Thomas Seymour, brother to former Queen Jane Seymour and uncle to Henry VIII's successor, King Edward VI - is usually portrayed as the major passion of Katherine's life. She and Thomas were involved before Henry VIII chose to make her queen. What I like most about Arnopp's novel is its construction. There are four sections, each narrated by a different character. - First, there is Katherine's step-daughter from the second marriage. From her we witness Katherine's loving and supportive presence and extreme kindness. - Katherine herself narrates the second section of the book, describing her initial horror at being chosen to marry the King, followed by her dutiful commitment to being both a good wife and Queen. - After Henry VIII's death, Thomas Seymour takes over as narrator -- and his character was the most interesting to me. Instead of his customary portrayal -- as someone deeply in love with Katherine Parr but having to step aside for a King -- Arnopp's Thomas is a scheming, ambitious egotist who cares primarily for pleasure and his own personal advancement. And that sets up to the story of Thomas's "flirtation" with Katherine's step-daughter, the future Queen Elizabeth I. - Princess Elizabeth is the fourth narrator, lamenting the errors of her own relationships with both Katherine Parr and Thomas Seymour and using those experiences to formulate her own public demeanor. Katheryn Parr's life has been retold it in a thought provoking and enlightening manner in this fine novel. Judith Arnopp has researched the early life Henry's last wife and using known facts of those times, speaks for Katheryn,Thomas Seymour, Elizabeth I and Margaret Neville Katheryn's stepdaughter. The story is thus told in four parts and the three others, using known facts, speak and give voice to Katheryn Parr's early life. A delightful and innovative way to weave a narrative. The events that Katheryn Parr's life has been retold it in a thought provoking and enlightening manner in this fine novel. 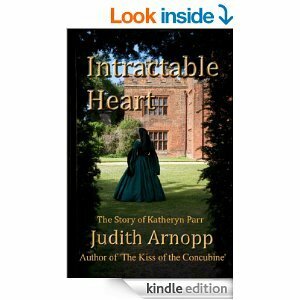 Judith Arnopp has researched the early life Henry's last wife and using known facts of those times, speaks for Katheryn,Thomas Seymour, Elizabeth I and Margaret Neville Katheryn's stepdaughter. The story is thus told in four parts and the three others, using known facts, speak and give voice to Katheryn Parr's early life. A delightful and innovative way to weave a narrative. The events that transpired on the Pilgrimage of Grace at Snape Castle can be surmised from other similar sieges. Arnopp tells us in the author's note that we know little about Katheryn's early life so she allows the others to speak for her.It works so very well that I am saddened to realize that this fine woman may have had so little true happiness in her life. I cling to the fact that she was so resilient and astute that there were good times as well as laughter for her. A wonderful story written by a masterful storyteller. She brings to life all the people who surround Katheryn Parr, the last wife of Henry VIII It is worth reading even though it's fiction. I hope you will enjoy the book as much as I did. Happy reading. I didn't enjoy this Judith Arnopp novel quite as much as I did the others I have read. It might have been the way it was written. This story of Henry VIII's last wife, Katherine Parr, is narrated by four different people. At times I liked that and other times I didn't. I found the switching of personalities confusing in the beginning . Once I got that figured out I really enjoyed the book. It is well-written. I never knew much about Catherine Parr this was enlightening considering it was a novel . I like it . Always passionate about history, I graduated from the University of Wales, Lampeter in 2007 with a Master's degree in medieval history and a BA in English and creative writing. I now devote myself to writing full time. A Song of Sixp Always passionate about history, I graduated from the University of Wales, Lampeter in 2007 with a Master's degree in medieval history and a BA in English and creative writing. I now devote myself to writing full time.